It’s finally here. Digg, the social link sharing site that has watched its once-meteoric rise to popularity level off over the last couple years, is relaunching today as it attempts to surge to greater heights — with an added focus on making the site better for publishers as well as users. Digg v4 will be rolling out over the next few hours, and brings some major changes that could totally change the dynamic of the site. Plenty of invites have been distributed over the last couple months, and we posted an exclusive preview back in May, but for most people this will be the first time they’ve experienced ‘New Digg’ for themselves. 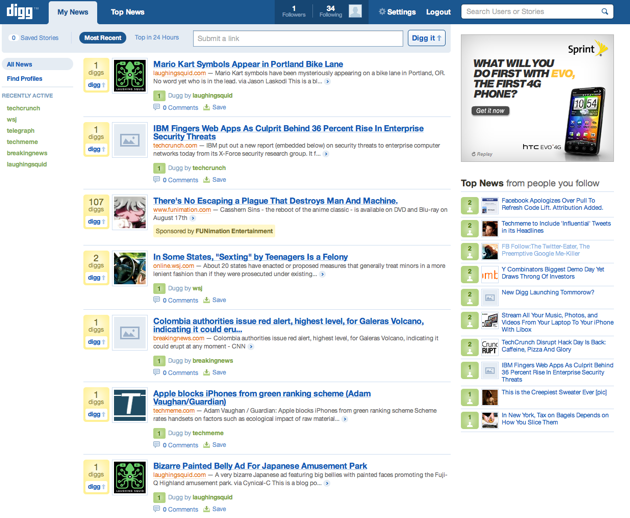 The biggest change to come in Digg v4 is the increased emphasis on social. When you first sign in, you’ll be walked through a flow inviting you to begin following other users, both from a series of lists curated by Digg and from friends on your Facebook, Twitter, and Google accounts (which you can easily connect with). Once you’ve done this, you’ll get to the real meat of Digg. Which, as it happens, looks a lot like the old Digg. As with the Digg you’re used to, you’ll see a stream of recent stories filling up most of the page, with ten top stories in a sidebar on the right. But there’s one key difference: each of these stories has been Dugg by one of your friends (or sponsored by an advertiser). Likewise, the stories on the right hand side of the screen represent the stories that have been dugg most by your friends over the last day or so. But fear not, Digg diehards — the Digg you’ve come to know and love is still readily accessible at the top of the page, via the ‘Top News’ section. Clicking this tab will transition over to a version of Digg that’s much more like the current version, with recent news and Top News as submitted across all of Digg. Other key changes include the link submission process, which is much more straightforward than it used to be. Before now if you wanted to submit a link to Digg, you had to provide an image and description to go along with it. Now these will be automatically added, the same way they are when you add a link to Facebook. Of course, there’s still one big question: will it work? At this point I’m skeptical, but it won’t be clear for some time. In order for this to lead to the resurgence Digg needs, user behavior will need to change, especially among casual users. The site has long been dominated by power users who account for many of the stories that hit the front page — now there’s much more emphasis on what your friends have shared. Which assumes, of course, that you friends are actually sharing things on Digg, which is hardly a given at this point. That said, you can also follow celebrity and publisher accounts, like the TechCrunch Digg profile right here to help flesh out your feed of stories. This launch has been a long time coming — it was supposed to launch back in 2009. In April, Digg founder Kevin Rose took over as CEO, replacing Jay Adelson — at the time we were hearing that he was unsatisfied with the progress of New Digg, which had already been much delayed.